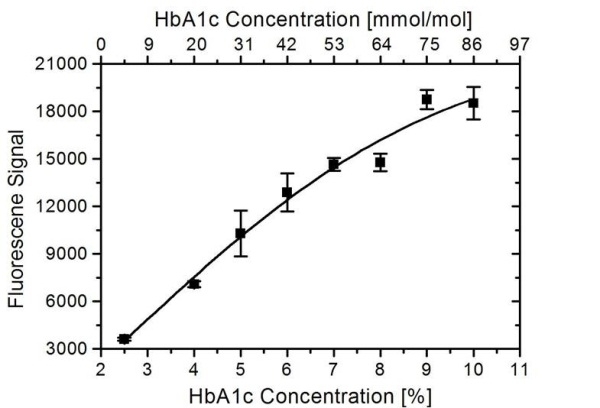 Data obtained from measuring the HbA1c content of serum samples using HRP labeled HCA181 antibody. Included were patient samples with abnormal hemoglobin (Hb). Besides binding to the normal glycated hemoglobin (Control 1, 2 and 3), HCA181 also recognizes the glycated hemoglobin variants HbE and HbD, but does not recognize the HbS or HbC variants. Elevated HbF cannot be detected due to the absence of the hemoglobin β chain. Values are given as % HbA1c. 1. Samples were obtained from heterozygous donors. The values reflect the percentage of abnormal Hb carried by the donor. Data obtained from measuring the HbA1c content of serum samples using HRP labeled HCA181 antibody. Included were patient samples with abnormal hemoglobin (Hb). Besides binding to the normal glycated hemoglobin (Control 1, 2 and 3), HCA181 also recognizes the glycated hemoglobin variants HbE and HbD, but does not recognize the HbS or HbC variants. Elevated HbF cannot be detected due to the absence of the hemoglobin β chain. Values are given as mmol/mol HbA1c. 1. Samples were obtained from heterozygous donors. The values reflect the mmol/mol of abnormal Hb carried by the donor. Human anti Human HbA1c antibody, clone AbD15790 recognizes HbA1c, i.e. hemoglobin when glycated at the N-terminal valine of the hemoglobin β chain. It does not bind to non-glycated hemoglobin. Besides binding to the normal glycated hemoglobin, it also recognizes the glycated hemoglobin variants HbE and HbD, but does not recognize the HbS or HbC variants. Elevated HbF cannot be detected due to the absence of the hemoglobin β chain. The measurement of HbA1c levels is used to identify the average plasma glucose concentration. In Diabetes mellitus, higher levels of HbA1c have been associated with cardiovascular disease and other diseases. Levels of more than 6.5% HbA1c (48 mmol/mol) are used as a criterion to diagnose diabetes. A monovalent human recombinant Fab (lambda light chain) selected from the HuCAL® phage display library, expressed in E. coli. The antibody is tagged with a V5 tag and a double extended Strep-tag at the C-terminus of the antibody heavy chain. This antibody is supplied as a liquid. The affinity of this antibody, as measured against the immunogen, was measured as KD=13 nM by real time, label-free molecular interaction analysis using HbA1c-BSA and HbA1c-TRF conjugates as immobilized antigen. The affinity of this antibody, as measured against purified HbA1c, was measured as KD=80 nM by real time, label-free molecular interaction analysis using full length HbA1c as immobilized antigen.